My third and final summit of the Sunday was Ben Nevis, VK3/ VS-009, which is about 193 km west of Melbourne, and about 25 km from the township of Beaufort. After activating Point 756 in the Pyrenees I travelled back down the Landsborough-Elmhurst Road and then turned right onto the Pyrenees Highway and travelled west. I then turned left onto the Buangor-Ben Nevis Road and travelled south. I then turned left onto Mount Cole Road, and then left onto Ben Nevis Road, which takes you straight up to the Ben Nevis summit. 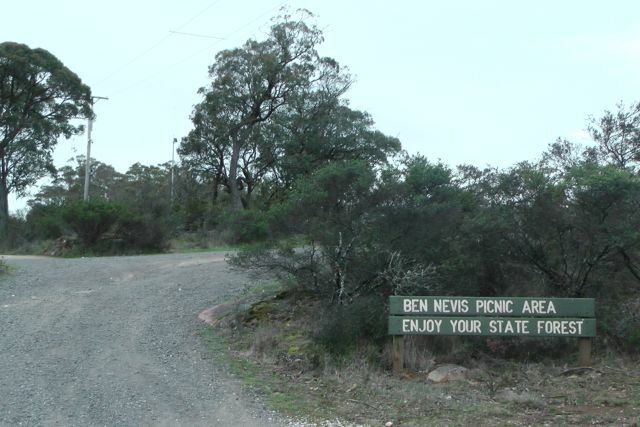 Ben Nevis Road is a dirt road but is in very good condition and is easily passable in a 2wd vehicle. Ben Nevis is 870 metres above sea level, and is worth 4 SOTA points. 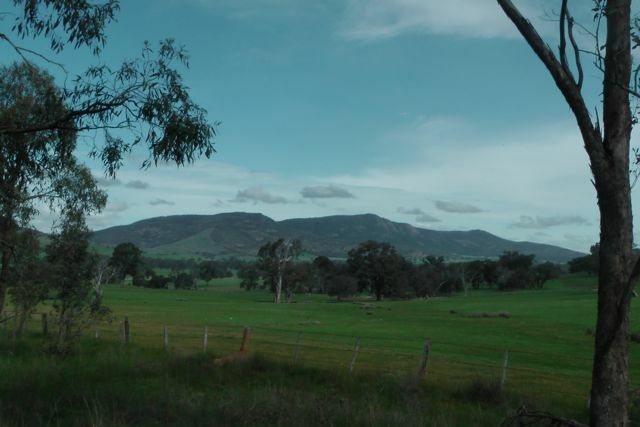 It is located within the Mount Cole State Forest, and marks the gateway to the Grampians and the Pyrenees wine district. Ben Nevis is popular with rock climbers and offers three distinct cliff faces: Red Rocks, North Cliff, & Centre Cliff. It is also used by hang glider pilots. 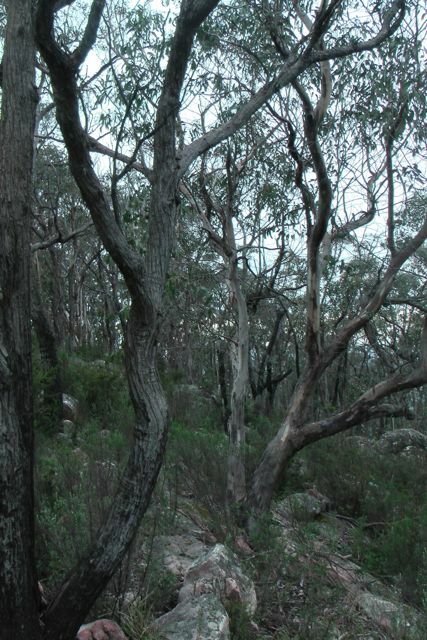 Mount Cole State Forest consists of large native trees including Messmate, Manna Gum, and Blue Gums on the wetter southern half, while on the northern side woodland species such as Yellow box and Red Stringybark grow. The rare Mt Cole Grevillia can also be found in the park, along with native orchids and a large number of wildflower species. More than 130 species of birds have been sighted in the forest, along with kangaroos, wallabies, echidna, koalas, and possums. The area was originally home to the Beeripmo balug aboriginal tribe, who formed part of the larger Djab Wurrung language speaking people. They called the area ‘Bereep-bereep’ meaning ‘wild’ Beeripmo translates to ‘wild mount’. 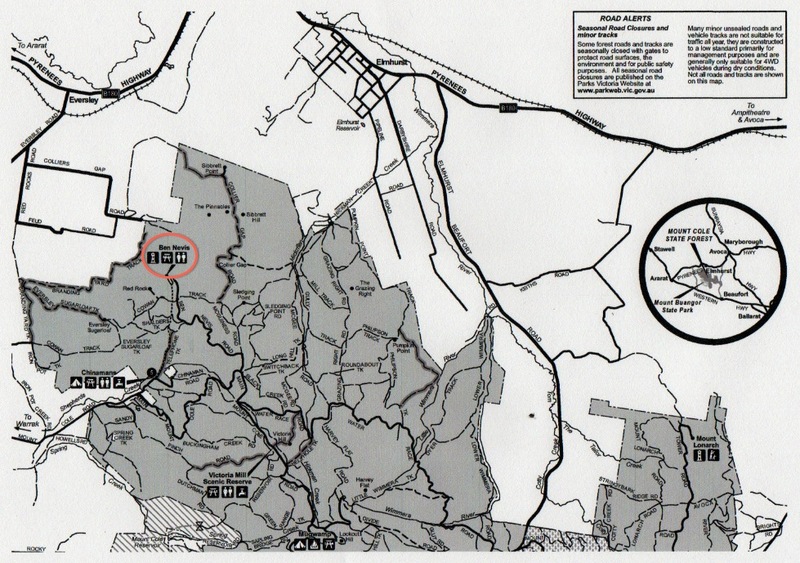 Following the 1836 expedition of Major Thomas Mitchell, settlers soon moved into the area. During the 1840’s timber harvesting with axe and cross cut saw commenced. By 1856, steam powered mills commenced in the area. By 1889, the demand from the towns on the Victorian goldfields fr building materials, firewood, and railway sleepers led to over thirty mills operating within the region, right up until 1904. 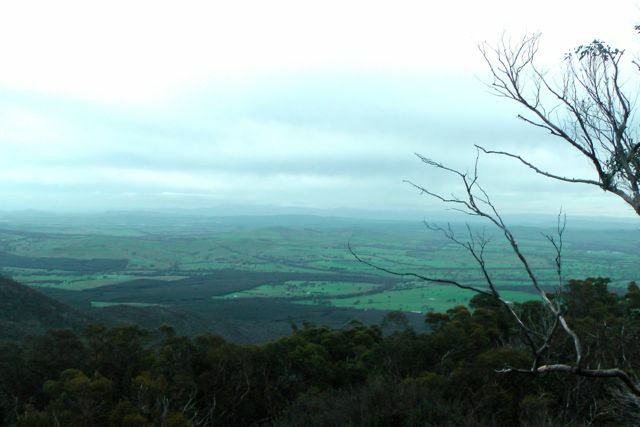 In 1981, the Victorian Forests Commission was established, and soon after Mt Cole State Forest was closed for timber harvesting. By 1947, timber harvesting was reopened. I parked the car just down from the carpark, packed up the gear into the back pack, and walked a short distance up to the summit. 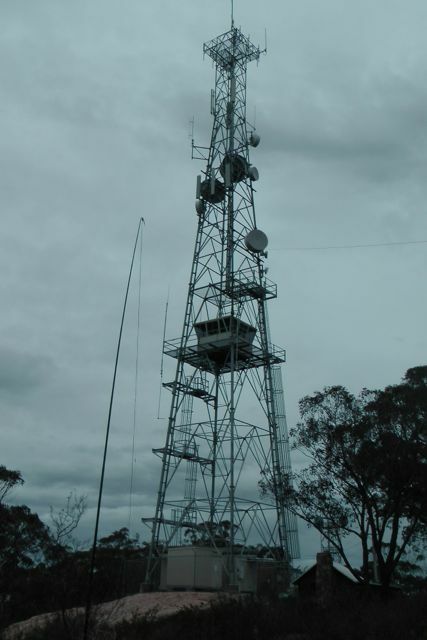 There are two large communication towers on the summit, but as I was to find out they did not cause too many problems with the noise floor. There are fantastic views on the top of the summit. 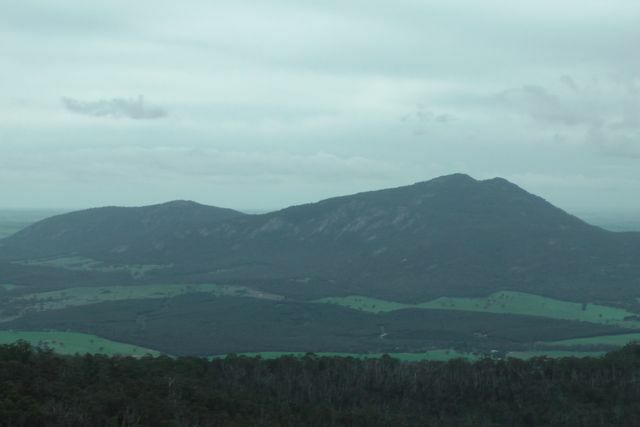 Out to the south is the imposing feature of Mount Buangor, which I was to climb the following day. Out to the east you can see Mount Lonarch which was also on my list to climb. 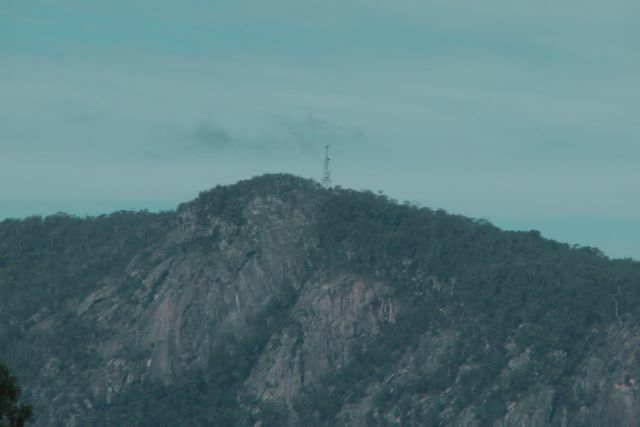 I set up the equipment on the eastern side of the summit, not far from the main communications tower. I sheltered behind a large moss rock which acted as a back rest. There were no problems with securing the ends of the dipole, as there are lots of trees and shrubs on the top of Ben Nevis. 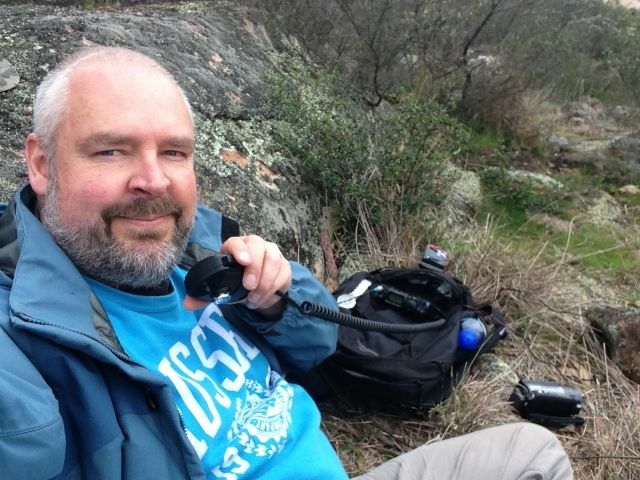 My first contact was with Andrew VK1NAM who was portable on Mt Tennant, VK1/ AC-026. My 2nd QSO was with Andrew VK1DA who was also portable on VK1/ AC-026. This was followed by the regular crowd of SOTA Chasers. QRP stations to call in were Andrew VK2ONZ, Andrew VK3ARR, and Brent VK2MEV. All of whom had very nice signals. I also spoke with Tony VK3VTH who was portable in the Little Desert National Park as part of the Keith Roget Memorial National Parks Award. From about 0615 UTC, the Over The Horizon Radar on 40m kicked in and was very strong, and despite the noise floor being low, it was proving difficult to work any weak stations. After 37 QSO’s on 40m SSB, I decided to have a listen on 20m to see whether I could work some DX with my QRP set up. The band was very busy with the All Asian Contest. In particular I heard about half a dozen Hawaiin stations calling CQ Contest. They were very strong, but unfortunately were participating in the contest, so sadly they weren’t looking to work VK stations. After 2 hours, I ended up with 43 QSO’s on 40m SSB & 20m SSB, and it was time to pack up and head back to Ararat. Andrew VK1NAM/p; Andrew VK1DA/p; Matt VK1MA; Tony VK3CAT; Brian VK3MCD; Mark VK3DEE; Ron VK3AFW; Fred VK3JM; Bernard VK3AMB; Mark VK1MDC; Tim VK5AV; Andrew VK2ONZ/qrp; Andrew VK3ARR/qrp; Peter VK3PF/p; Andy VK5LA; Nick VK3ANL; Warren VK3BYD; Roy VK5NRG; Dale VK5FSCK; Gavin VK3HY; Peter VK3FPSR; Greg VK3HBM; Rhett VK4GHZ; Brent VK2MEV/qrp; Ed VK2JI; Dean VK1DW; Brad VK3LOX; Graham VK7ZGK; Colin VK3UBY; Ian VK3TCX/m; John VK2YW; Glen VK3YY; Tony VK3VTH/p; Freddo VK3FDI/mm; Darrel VK5JDS; Don VK3HDX; Rod VK5FTTC; Roger DL5RBW; 5Q1A/p; Phil ZL2RVW; Peter VK4AAV; EA2KC; Ian VK3FD/4.